As of 2015, more searches are performed on mobile than desktop, meaning mobile is the main device used worldwide for the majority of online browsing time. Google has been strongly emphasizing the mobile-first perspective ever since. In April 2015, Google made a pre-announced update to the algorithm that ranks mobile search results. A website’s mobile friendliness officially was dubbed a confirmed ranking signal for mobile search rankings. In late 2015, the Google Quality Rating Guidelines were updated with screenshots from the perspective of mobile devices. In November 2016, Google pre-announced an update to its search index, moving to a mobile-first index. This means that Google uses your site’s mobile version in ranking calculations. And this coming January 2017, sites that show an intrusive interstitial in the transition from a mobile search result to the content clicked will not rank as highly in Google results. Google is optimizing its users’ mobile search experience and webmasters must be in lock step. 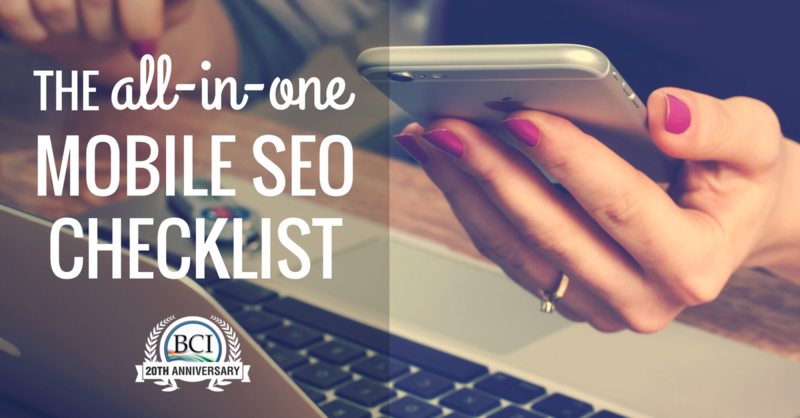 Consider this checklist your mobile SEO go-to resource. If you’re already on board and optimizing for mobile, jump to the section that best suits your needs. If you’re new to the game, start from the beginning and use this checklist as a start-to-finish guide. There are primarily four varieties of mobile page strategies: responsive design, dynamic serving, separate mobile page and Accelerated Mobile Pages (AMP). For both mobile and desktop searchers, Google is looking to rank web pages that show high relevance, trust and great user experience. Remember, to rank for a target query Google needs to deem your web page the most relevant and “least imperfect” option for that query. While your desktop-optimized web pages may be incredibly relevant, if your code does not allow for your content to fit the smartphone experience, Google recognizes this as a poor user experience. A poor user experience means your website gets further from “least imperfect” and your rank drops further down the SERP. Since ranking high in mobile search results needs to be a priority, building a dynamic or separate mobile platform for your content needs to be a priority as well. You have options for how to display your content for the mobile user agent and visitor: responsive design; dynamic serving; a separate mobile site; and Accelerated Mobile Pages (AMP). The solution — or combination of solutions — that’s right for you will depend on many factors including development resources, conversion goals, mobile keyword research versus desktop keyword research, and persona behavior. A Cheat Sheet for Mobile Design: Responsive Design, Dynamic Serving and Mobile Sites — an article that compares and contrasts three technical options for a mobile website. Building Smartphone-Optimized Websites portion of the Google Developers website. Chapters one and two of Building Your Mobile-Friendly Site: The Distilled Best Practice Guide. AMPProject.org for a technical introduction, tutorials and sample code for building an AMP HTML page. When optimizing your mobile platform, don’t forget about your technical SEO best practices. If you skip the technical SEO on your mobile site, search spiders may have a hard time discerning mobile-specific content from desktop-specific content, which can create a bad user experience in both the mobile and the desktop experience. 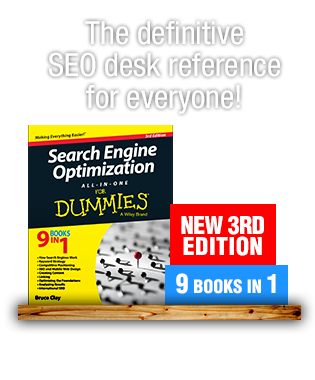 Remember the basics: search engine spiders need to be able to discover, crawl and index your web pages in order for them to rank. In other words, if a search spider cannot find and access your site pages, your site cannot rank. Create a mobile XML sitemap with a <mobile:mobile/> declaration after each URL listing. Submit your mobile site and your mobile XML sitemap to Google Search Console. Never design your mobile site using pop-up windows or lightboxes that cannot be discovered through a sitemap crawl. Make sure to implement rel=canonical, rel=alternate media and Vary: User-Agent HTTP Header tags as needed to tell Google when it should deliver a desktop version of your web page and when it should deliver a mobile version. Make sure to allow the Googlebot and Google Smartphone user agents to access your site. This is very important to both the user and the search spider! According to the PageSpeed Insights portion of the Google Developers help site, Google prefers above-the-fold content to render in under a second on a mobile network. Anything longer than a second, they say, can result in a poor user experience. The idea is to get users interacting with the page as soon as possible. On the user experience end: According to Google and Strangeloop, 85% of mobile users expect sites to load at least as fast as desktop sites. So improving mobile site speed needs to be a goal. Focus on mobile image optimization to reduce load times. Follow the page speed optimization recommendations outlined in the Mobile Analysis portion of the Google Developers PageSpeed Insights resource. Use front-end optimization strategies, such as mobile-optimized caching, to address mobile performance issues and get mobile pages loading faster. Regularly check your page speed using the Google PageSpeed Insights analyzer. In the context of mobile optimization, design describes the elements of the web page the end-user sees, and user experience (or UX) describes the experience that design creates for the user, how they interact with elements on the page, how the elements on the page make them feel, whether the site is easy to use or frustrating, etc. Google wants happy, satisfied searchers, so user experience is a huge priority for the search engine. Create a bad above-the-fold user experience and expect your site to rank somewhere far from Page 1. Straight from Google. More than half of your inbound traffic is unlikely to return to your mobile site if they are met with a poor user experience. This means serious loss in conversion, as well as loss of mobile rank. Are you using Click-to-Call buttons? Is your logo a button that makes it easy to get back to your home page? Are your buttons finger friendly? Have you placed your most important CTA button above the mobile fold? Is the site search visible above the fold in your mobile design? Can you add filter elements to make searching your site on a mobile device easier? Did you make sure it’s impossible for search filters to return zero results? 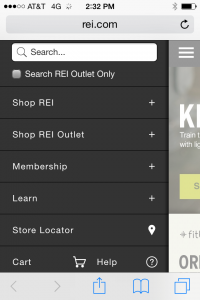 The REI mobile site makes it easy to filter search results. Is your mobile experience optimized for task completion? Can your forms be simplified? Can login requirements be simplified? Can users purchase as a guest? Are your menus working for the user? Can you simplify them? Would your pulldown menu work better as toggle menu? Would a third-party payment service make paying with a mobile device easier for your end user? Do any of your forms or other windows open in a pop-up window or lightbox? If yes, fix this. Pop-up windows and lightboxes are bad for UX and SEO. Does your user have to pinch, scroll side to side or zoom out to see your web pages? If yes, fix this. The Google representative quoted above specifically referenced a user having to “zoom in or pan around excessively” as an example of bad user experience. Your mobile platform should deliver web content that is sized to fit mobile devices. An example of a mobile toggle, or hamburger, menu. It’s not a new concept. How can you understand where your web pages are succeeding and failing if you’re not tracking activity with analytics? Don’t overlook this important step on your mobile platform to show ROI in exchange for buy-in and budget. Implement analytics across your mobile site. Develop intelligent mobile- and conversion-centric metrics that give insight into how your personas are interacting with your web pages. Remember to look at micro-conversions and device-specific bounce rate. When possible, define your mobile goals early then build mobile web pages with a task flow that makes conversion easier for the user. Remember desktop rank and mobile rank can differ greatly. Page one in mobile SERPs tends to include significantly fewer organic results than desktop SERPs, and the keywords your personas are using to search for you in the desktop experience are not necessarily the words they’re using in mobile. Make sure your mobile stats are coming from true analysis of mobile SERP activity. Make reporting easier by setting up a custom mobile campaign dashboard. Monitor mobile site speed in Google Analytics by navigating to Content > Site Speed. I won’t say “content is king” one more time, but I will say content really matters. Content is the means by which your users get to know you, your products and your services. 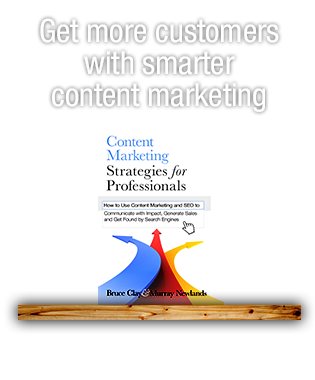 Thoughtful content is truly key to conversion. Plus, without strategic content you can’t optimize your web pages for keywords, which means your web pages can’t rank in the desktop or mobile experience. Is your content resonating with mobile users? Don’t set it and forget it. Instead, keep on adding and testing content types and measuring the corresponding mobile tracking variables. All mobile content is not created equally. What works and reads well on one device type might not work at all on another (think smartphone experience versus tablet experience). Is your content easily read without excessive scrolling or zooming? 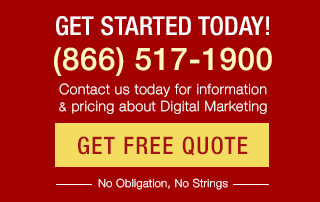 Are your digital assets – images, videos, navigation, etc. – easy to see without scrolling or zooming? Are you calls to action front and center? Can you place a call to action above the fold? 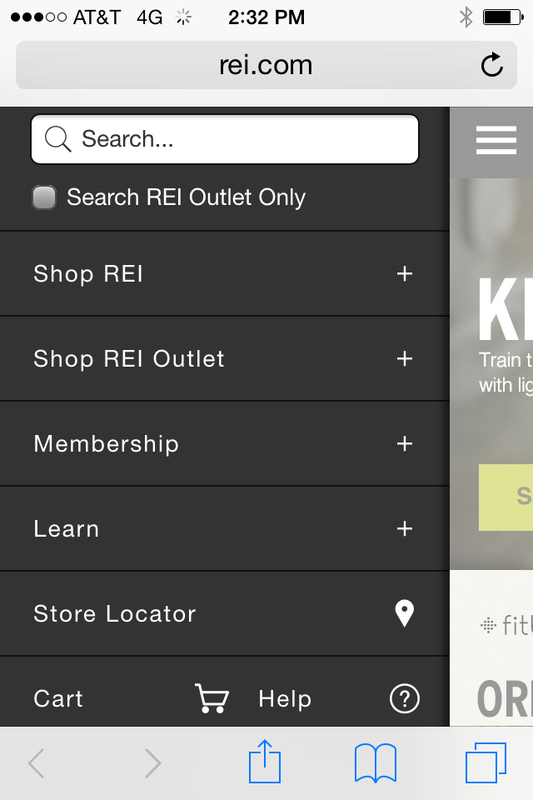 Here, the REI mobile site uses a “Find in store” button to optimize for local UX. Can your content be optimized for local? For instance, can you include the stock of product available nearby like REI does? 62% of keywords have different ranks between desktop and mobile. Have you done mobile-specific keyword research? Are your mobile users using search phrases that are very different from the phrases your desktop searchers are using? If yes, consider using dynamic serving to deliver mobile-optimized content to your mobile users. Are your meta tags optimized? When appropriate or necessary, are they optimized specifically for mobile? Social content is mobile content. Are you integrating your search, social, video and mobile campaigns? So you picked a mobile platform, designed your mobile pages with user experience in mind, and created mobile-optimized content. Great! Now… is it working? Does it look like you intended it to look? Is Google seeing it how you think Google should be seeing it? Are all the usability features you built into your web pages actually working for your users? Don’t set it and forget it. Mobile optimization is all about testing and retesting over and over again. Have you tested on a range of devices using an emulator, or a series of actual devices? With each website release, the configuration needs to be checked. Are you testing your UX using real people that represent your personas? Have your friends and family test your site. Google will add snippets to mobile SERPs warning searchers when the website they see listed may yield a sub-optimal user experience. Warnings include “Uses Flash” and “May not work on your device.” Have you checked to see whether your site is being amended with Google warnings in mobile SERPs? Use the W3C Mobile Checker to test your website’s true mobile-friendliness. Yet there’s no better quote to emphasize not only the importance of mobile SEO, but more so the importance of effective mobile SEO; of not just optimizing for mobile, but optimizing the right way for mobile. Times are changing and the way that people use and access the internet is changing, so we as marketers need to be changing the way we think, analyze, create, package and deliver content. How are you optimizing your web pages to make sure they are mobile ready? Let us help you drive and track traffic to your website with a mobile-first SEO strategy. BCI’s services are tailor-made to match your business goals and audience. Let’s talk more about growing revenue through digital marketing. This post was originally published by Chelsea Adams on Oct. 29, 2014, and updated on Nov. 23, 2016. Great tips! With increased usage of smartphones Mobile SEO is like a lifeline for digital marketers. It is a trending tactic adopted by maximum brands at present. This post is very helpful to business who operate their business by mobile website or applications or depend more on mobile website or application.. Thanks for the insight and no doubt this will help us in designing our mobile SEO strategy too.Although educating clients regarding the importance of mobile SEO has been a challenge for us. Mobile SEO is the future and a great and much needed post for Webmasters. Very insightful and in-depth advice here. You’re 100% right, SEO and a mobile-first mentality are extremely important for a business, especially a start-up. Visibility is the first barrier you need to pass to be considered. Thanks for sharing! If anyone is using WordPress then they can use the plugin called “Speed Booster Pack” which will easily move all your JS to the footer and Defer JS. It really works, you can instantly see the boost in your page loading time. On my blog 70% traffic is from Mobile device nowadays. I optimised my website loading speed by moving JS to the footer and deferred JS loading. UX of a mobile phone is very very important because of it directly proportional to the page view. If very good navigation is there then obviously page views will be more. I’ll suggest creating a separate template for Mobile and Desktop. Google give more weight to the websites with responsive web designs. Even the companies who do not have the responsive designs are converting their website designs to increase sales and to boost their website rank. Their are some SEO experts who are saying that even the Bounce rate of the website effect the SEO. The bounce rate does effect the sales of the companies. Bruce Clay,what do you think about bounce rate? After famous mobilegeddon I have optimized my old site for mobile devices but it’s hard to change it for older websites. In my opinion best way to do this is to create new subdomain http://m.example.com/ and buy hosting for it. (Duda mobile) It gives you more speed for mobile version and it’s separated from main site. Great post, The idea Google providing preference to website optimization on a mobile device, Mobile SEO is continuing to rule on the apply year. Great Articule, it is a must to build mobile friendly and responsive website, soon enough to update them to AMP pages. Thanks for the insight! I highly agree with the comment above “Anything Worth Doing Is Worth Doing Right” the first time. We have ran some testing after “mobilegeddon” and had found that its best to run these as fast as possible to see if the content will be distorted on the smart phone right away. Some of the “Responsive” WordPress themes had come up distorted which should have been noted immidiatly, but had gone undetected because we just assumed they would work perfectly. So in a nut shell, We have a priority system to always test our responsiveness right after web development completion. Awesome article. At present its very important to build SEO and responsive design for mobile. This post will help me a lot. Thanks for sharing. This is just a fantastic list! Thanks for always adding resources as well. Absolutely sharing this with my team. I love Bruceclay blogs their just simply easy to understand and start taking action I been testing AMP pages I have today it has been one of the most effective strategies you can implement right now and see results. Thanks for another educational blog. Great Read…The way Google giving priority to website optimization on mobile device, Mobile SEO is going to dominate next year. Totally useful. Great tips on mobile SEO is one of the best posts on this topic. You are absolutely right mobile search are increasing day by day. I have seen my analytic approximately 60-70% visitors are from mobile devices. From this, we can conclude that it’s necessary to have mobile friendly design. And now AMP integration is necessary too, it will increase our page speed on mobile devices. Thanks for sharing fruitful SEO checklist! I am always looking forward and waiting for Bruceclay blogs! Keep it up! One of the best posts on this topic. This is so really important today to optimize our web assets for mobile devices. Next we need to make our websites more responsive to different upcoming wearable devices. Great tips on mobile SEO. Totally useful. Thanks for the informative blog. This will steer our web design department in the rigjt direction when it comes to mobile optimization. Bruceclay is the number seo blog in the world , Your articles are so actionable that a seo newbie can easily implement them. Thanks for the comment, Al — and thanks for reading all the way to the conclusion! Ya know what’s funny, I actually had the conclusion as the introduction right up until the last draft of this post and then I did some shuffling around because I thought it was important to introduce this topic with some nice, strong Google-fueled “mobile really seriously matters” ammunition. “Plenty of businesses fail because […] they hardly optimize after creating a responsive website.” I absolutely agree. Many businesses think it’s enough to set up a responsive design and then tip-toe away, like their job is done. Responsive design is a great solution, but it needs UX tweaking, image optimization, and technical SEO attention, just like any other mobile site approach. I highly agree with your steps and especially the conclusion. It’s not enough that we know mobile SEO – we should do it right. Plenty of businesses fail because they either optimize it wrong; or they hardly optimize after creating a responsive website. We should not stop at the front-end. Rather, we should keep finding ways to improve our strategies. Thank you for sharing your tips. Its one of the usable list about all the mobile friendly design strategies. Since its important to have mobile friendly websites these days since as all we know that mobile searches are rapidly increasing and its has create boom in IT sector. Thanks for sharing such usable information. Yes!! Mobile needs to be a priority this year. If you need some fuel to motivate your team, pass along this September 2014 comScore State of Mobile report: https://www.comscore.com/Insights/Presentations-and-Whitepapers/2014/The-State-of-the-Mobile-Industry. Today 55% of all Internet traffic is coming from mobile devices and 45% is coming from desktop computers. In other words: people are using mobile devices – apps and the mobile browser – 10% more than they are using their desktop computers to access the Internet. If you’re not optimizing for mobile chances are good you’re missing conversion opportunities left and right. A lot of my competitors here in France don’t manage to make a mobile website for their clients. When we see that more than 75% of queries are done on mobile : We obviously need to optimize the site to go mobile. Thank you for your checklist. Glad you found it helpful, Colin! Technical optimization for mobile is an important step that’s often overlooked. Great information, i like this one.